Butter loaf pan, 9x5x3 inches. In top of double boiler, melt butter in milk. Stir in frosting mix (dry) until smooth. Heat over rapidly boiling water 5 minutes, stirring occasionally. Stir in nuts and cherries. Spread mixture evenly in pan. Let stand until firm. Cut into 1-inch squares. 32 squares. In medium saucepan, melt butter in water. Stir in frosting mix (dry) until smooth. Heat over low heat 5 minutes, stirring constantly. Remove from heat; stir in nuts. Drop mixture by teaspoonfuls onto waxed paper. Let stand until firm. 3 to 4 dozen candies. In order for me to eat the Cherry Opera Fudge l would have to use milk/dark chocolate frosting because l don’t like white chocolate. 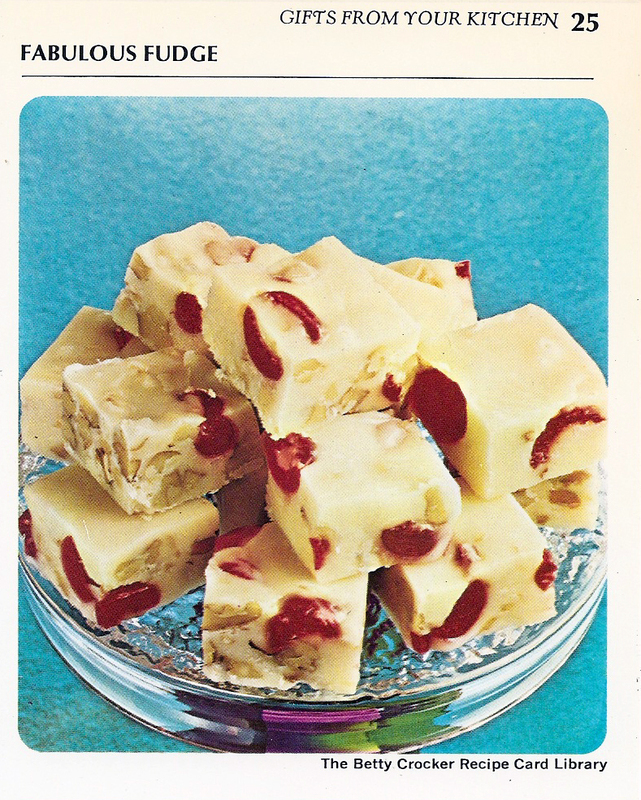 I used to make this fudge EVERY year for years. It was a tradition, but now I can’t get the frosting mix anywhere. My kids are all grown with children of their own but they still crave my “opera fudge”every year. Do you still make it $ where can I get it. It would be the best surprise if I could surprise them with my fudge again. PLEASE help thank you.